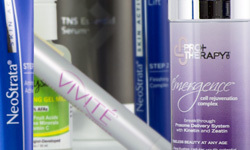 Get rid of wrinkles with the best in dermatologist-recommended anti-aging products. Developing wrinkles is a normal part of life, but that doesn’t mean you have to put up with that smile line you discovered in the mirror this morning. There are many different types of wrinkles with just as many causes, and there are anti-aging skin care products for every concern. Wrinkles associated with aging are typically caused by sun damage, habitual facial expressions, smoking, an overly sugary diet, and many other factors. These environmental and lifestyle stressors combine to sap your skin of vital nutrients, slow collagen production, and weaken the elastin fibers which give skin its youthful resiliency. This causes skin to become thin over time, which in turn increases the risk of developing new wrinkles even through simple activities like sleeping. While there is no miracle wrinkle cream to stop aging in its tracks, a few simple changes can make a great difference toward long-term skin health. Using an SPF 30 broad spectrum sunscreen daily is the best way to protect skin from the sun’s damaging rays, and cutting back on refined sugars can help to slow the process of glycation which leads to sagging skin. In addition to these healthy habits, there are also a wide variety of anti-aging skin care products available to treat every problem area, such as under eye and forehead wrinkles, crepey skin on the neck, arms, or legs, and fine lines around the mouth. The best anti-aging treatments have ingredients like antioxidants, growth factors, and probiotics which actively restore and protect your skin from future damage. At LovelySkin, we want to help you find the best anti-aging products for your needs, and our Customer Care Team is on call to answer any questions you have about the dermatologist-recommended products we carry. If you’re not sure where to begin, they can recommend great products to help you build a customized anti-aging skin care routine. Browse our wide selection of products today to learn more about how to treat wrinkles and keep your skin looking young, healthy and radiant. Visit the LovelySkin Blog and Video section for even more helpful tips and detailed skin care how-tos.